"A fruity blend of juices, tea and bourbon whiskey are frozen into a slush, and then served topped off with lemon lime soda. This takes a while, but it's worth it!" 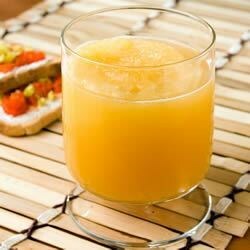 In a large bowl or container, mix together the orange juice concentrate, lemonade concentrate, pineapple juice, sugar, tea, and whiskey. Transfer to shallow bowls or dishes, and freeze overnight. Remove the frozen mixture from the freezer and let stand for about 10 minutes. Chop with a wire whisk or potato masher to make a slushy consistency. Place scoops of the frozen slush into glasses, and top off with the lemon-lime flavored soda. Cool off a hot summer evening with a refreshing, icy whiskey cocktail. I keep a frozen container of this in my freezer at ALL times. Only I don't like Bourbon so I use Bacardi. It is great. I doubled the orange juice and left out the pineapple. Great summer and holiday drink.